I HAVE LOVED all things Disney since before I can remember. I wanted to be Annette Funicello from The Mickey Mouse Club. When I got a bit older, it was Haley Mills from the movies on The Wonderful World of Disney: the original Parent Trap, Summer Magic, The Moon Spinners. When I was five years old, my favorite movie became 101 Dalmatians. As soon as I walked out of that movie lobby I wanted a Dalmatian. I just loved Pongo, Perdita, and all the spotted puppies. Years later, in my adulthood, I finally owned two Dalmatians. They were great dogs! It’s still my favorite movie. There was the parade of other Disney movies I fell in love with over the years. I was always amazed with Disney movies. They have storylines that make you truly believe that if you try hard enough, and believe strongly enough, anything is possible. Sleeping Beauty can find love’s first kiss to wake her. Pongo and Perdi can get their puppies back. All it takes is to try, and to believe hard enough. Slowly and quietly my Disney obsession grew. But it stayed in the background for a lot of years. I didn’t really acknowledge it, even when my boys were young. They were into the Star Wars thing and Disney hadn’t jumped on the Star Wars bandwagon yet. Then I discovered WALT DISNEY WORLD! Walt Disney World. Just an expensive amusement park? Well, yes, and no. . . . It is expensive, and it’s a park with amusements, but it’s so much more than that. It’s a “theme” park. It’s the way Disney can set different moods within every park, or tell you a story within every ride. But for me it’s even more than that. It’s a state of mind, a relaxed feeling of not caring that you are happily hugging a giant duck named Donald (did you know his middle name is Fauntleroy?) or following Capt. Hook around, taunting him with tick, tock, tick, tock and hearing the children’s laughter with his reaction. It’s exactly what I believe Walt Disney wanted it to be: the “happy place” for so many families. After several years of seeing TV commercials about Walt Disney World, my husband and I decided it was time to take the long trip south, from the cold Northeast, and see it firsthand. By then our sons were grown and starting families of their own. 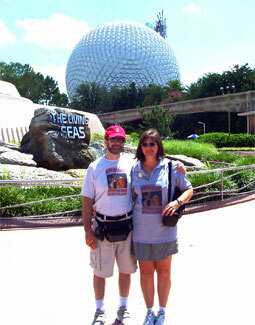 Mike and I have been to Disney World eleven times since 1996. It opened on October 1, 1971 with only the Magic Kingdom theme park, but by the time we got there Disney had three parks. We got our first sighting of Cinderella’s Castle that evening at the Magic Kingdom, standing regally above the trees that graced the center hub at the end of “Main Street U.S.A.” I was hooked! It was just as it looked in the movie Cinderella, made way back in 1950. As we walked inside the Castle, we found ourselves in a passageway to Fantasy Land. 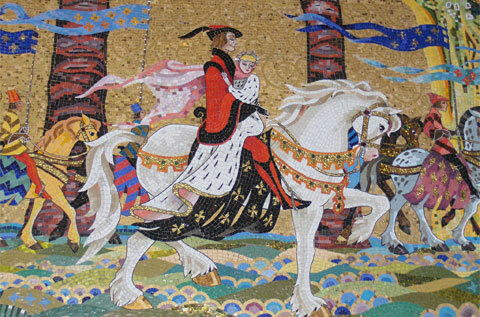 The walls were covered with a mosaic mural of different scenes from the movie. I love this mural. It contains one million pieces of glass in 500 different colors, including some tiles made of 14-karat gold. Beautiful. 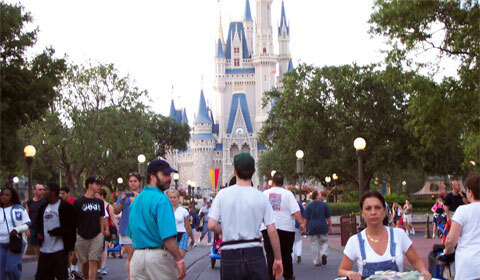 So here I am confessing to the world of blogdom that I am, indeed, a Disneyophile. I’m OK with that, though—and I hope that after reading this maybe someone else will discover how special the “World that is Disney” can be. Our Disney specialist, Elizabeth Villanella has lived in the Montrose, Pennsylvania area most of her life. Betsy married her high school boyfriend in 1973. As an Air Force wife, she has lived in Texas, Italy, and Virginia. Between the two of them, her sons have given her fourteen grandchildren and counting. Betsy and her husband currently live with Albert K. Ninestein, a mini Schnauzer who’s as smart as his namesake. She loves to travel and wants to experience (and share) as many places in this world as she can! Betsy tweets as @betsy_v. I love Disney World! What a great article! 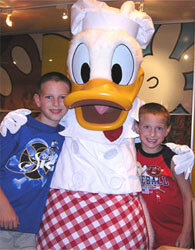 You are not alone in your Disney obsession….but you might be the only one who knew Donald’s middle name! Betsy, I love it! I can’t wait to see your next post!….WooHoo! Congratulations! Ann, Thank you so much for the comment! You have been awesome! Disney World is A great place and I have a ton of stories to tell about it! I can’t wait for your stories – you have a gift for story telling AND Disney! Really enjoyed it, it was almost like being there…again. Loved it! Looking forward to reading your future articles! Did you show Mike and Doug their picture! They are now famous. Well sort of! So happy you liked it! More to come, with all the research in August! So keep checking in! Milliver’s Travels other stories are very interesting too! I loved it!!! I can remember watching every single Disney Movie with you growing up! You did a fantastic job! So proud of you can’t wait for the next one! Congratulations!!! Love you! Thank you so much! It is a lot of fun! I can remember watching Disney movies with you too! I’ll let you know when the next one is posted. 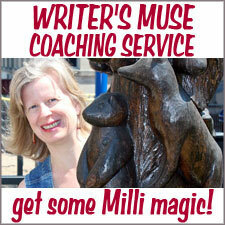 In the mean time, there are some very fun stories to read from other writers on Millivers Travels. A great one I think you will like is about “Oklahoma City from a foodies prospective” done by my good friend Ann! Enjoy! Now I NEED to go back to WDW! Great Article, I look forward to more. Thanks!.. Is there a Disney World mini meet in the future? Maybe on a Disney Cruise??? I would enjoy writing about either! Fabulous “confession” Betsy!!!! LOVE it!!!! Keep those wonderful stories AND photos coming for all of your “Disneyophile” friends (public & private) LOL!!!! I will do my best to keep you all fully “DISnified”! what a great article! Your writing was very descriptive making it feel like I was going back tomorrow. I can’t wait to read your future articles (implying there will be more I hope) I love you. I am so glad you like the article! I cant wait to have you read them, you have helped me make a lot of the great memories I will be writing about! Very nice Betsy. Good story. Love the pictures… You did it!!! It was a lot of fun!…Stay tuned for more! Great article. Disney was the best vacation I have been on. Thanks to you and Mike being able to accompany me and show me the ropes. It is truely the happiest place on earth. Someday I will go again! Thanks! I am having so much fun writing! It was a fun vacation. It would be great to have you join us on the cruise. Miss you too! Thank you! Maybe someday you will! How inspiring! I loved reading your writings on Disney. I can relate to so much. It is such a happy place to be, even when you cannot actually be there. Disney is in our hearts. Thank you Jill for the nice comment. I couldn’t agree with you more! Disney is a place the lightens your heart,and make you feel like a kid again! More articles to come, so keep checking in! Thank you! I enjoy writing for Millivers Travels! Disney does become an obsession, but a really nice obsession! I hope you get another chance to go to WDW! Betsy, another fantastic article. Can’t wait to read all of the rest. Thank you Robin, I hope you enjoy them too. 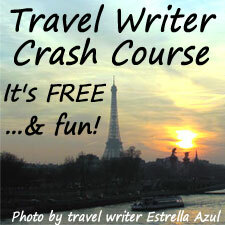 HI BETSY: I SO ENJOY YOUR WRITINGS AND PHOTOS. YOU HAVE A GREAT TALENT. I LIKE DISNEY TOO AND HAVE A GREAT RESPECT FOR WALT DISNEY. HE CERTAINLY HAD A WONDERFUL IMAGINATION AND HAS DONE A WONDERFUL JOB IN CREATING HIS PERSONALITIES AND THE THEME PARK ALTHOUGH I REALIZE HE IS NO LONGER WITH US BUT HE HAS LEFT A GREAT LEGACY. Thank you for your nice comments. Writing keeps me happy in between adventures! Walt Disney was not only a genius, but saw the value in creating happiness in others.